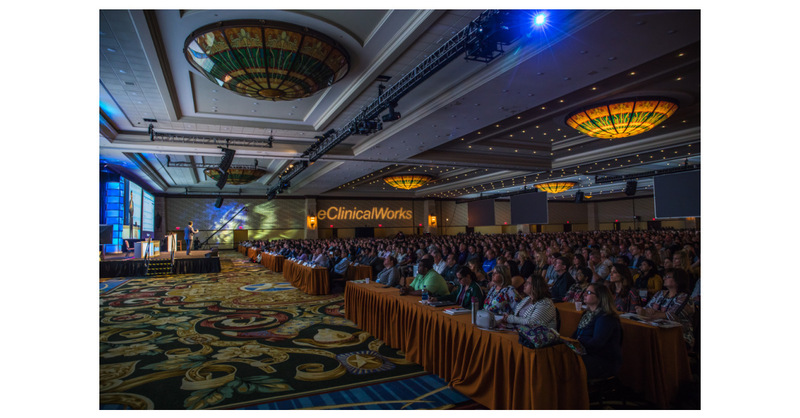 NASHVILLE, Tenn.–(BUSINESS WIRE)–eClinicalWorks National Conference — eClinicalWorks®, a leader in healthcare IT solutions, today kicks off its 2018 National Conference, announcing innovations around physician burnout, interoperability, and telehealth technologies. The event is sold out with a crowd of over 5,000 on-site attendees and another 5,500 employees livestreaming. The conference brings together users of eClinicalWorks’ software for education, training, and networking. Conference attendees include physician practices representing a wide variety of sizes and specialties, departments of health, hospitals and health systems. During the event, thought leaders, product experts and customers will share best practices, receive hands-on product training and participate in more than 115 educational sessions, including 12 different tracks, of which two are specifically focused on patient safety and employer health. Attendees also receive an exclusive look at how to optimize the eClinicalWorks solutions and increase practice efficiency and improve patient satisfaction. Of the sessions, 80% are eligible for Continuing Medical Education (CME/CE) credits. Technology solutions to reduce physician burnout. Showcase opioid decision support with the physician working in the EHR to better manage the opioid abuse. Prizma, the health information search engine. Hello2healow (h2h), dedicated to making communication between provider and patient more open and transparent. eClinicalWorks is also reporting its strongest sales year, with more than 10,000 providers adding the eClinicalWorks comprehensive EHR/RCM solution — contracting with small, midsized, and large enterprise clients, including FQHCs, Ambulatory Surgery Centers, and ACOs. eClinicalWorks® is a privately held leader in healthcare IT solutions. With more than 130,000 physicians and nurse practitioners using its solutions, customers include ACOs, physician practices, hospitals, community health centers, departments of health, and convenient care clinics. During the past ten years, 19 eClinicalWorks customers have received the prestigious HIMSS Davies Award, honoring excellence in Electronic Health Record implementation. The company is second largest in the country for e-prescribing. Based in Westborough, Mass., eClinicalWorks has additional offices in Austin, New York City, Chicago, California, Georgia, London, India, and Dubai. For more information, please visit www.eclinicalworks.com, Facebook, Twitter or call 866-888-6929.
eClinicalWorks is a trademark of eClinicalWorks, LLC. All other trademarks or service marks contained herein are the property of their respective owners.